Did you know that your operating system’s registry is one of its critical parts? While your system’s stability and performance do rely on your computer’s hardware it is also essential to have an organized, working Registry to maintain them. When the Registry is cluttered with errors and duplicate or even useless entries your system might experience decreased performance, freezes, crashes and many other problems. 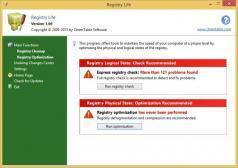 Registry Life is a free utility that can reliably optimize your system Registry but also detect and fix various Registry errors. It’s one of the simplest solution for Registry maintenance of Windows-based systems.